As is to be expected, July has been a fairly tricky month. With high temperatures, and low oxygen levels in the water, the fish have been particularly lethargic. The morning period has been by far the most productive time. The afternoon fishing has been difficult and we recommend you stay active when the temperature soars, keep walking the lakes and you’ll find plenty of fish tucked up in the shaded areas. Despite the tough conditions plenty of big doubles have graced the bank. A 15lb 4oz rainbow was caught by Clive Moore from lake one on a Goldhead Damsel. Avington regular Ian Davidson also landed a 15lb 4oz rainbow, his coming from in between the trees at the top of lake two. Ian presented a small Black Buzzer to get the fish’s attention, but after a missed take he finally got his target on a Pink Shrimp. Ian also managed a 12lb rainbow from lake two a few days later. Stephen Bartholomew caught a fin-perfect rainbow of 13lb 12oz from lake one using a Black Stalking Bug. Dave Hutton produced the goods with a lovely 13lb 8oz rainbow from lake one. He presented a small Buzzer under a tree where the fish was escaping the bright sunshine. Blake Burgess claimed the bragging rights on the Grundon corporate day with an immaculate 13lb 4oz rainbow tempted on a Black Montana. Regular Richard Francis was back among the big fish this month with three doubles! He started the month with rainbows of 10lb 8oz and 11lb from lake one on small Buzzers. He then managed an 11lb 8oz rainbow from lake two on a Stalking Bug. The usual lures have proved rather hit and miss, working well during the early hours but grinding to a halt by late morning/early afternoon. The most productive method has been to put the fly to the fish rather than expecting the fish to come to the fly. A high degree of accuracy is required and small weighted flies are most effective with Hare's Ears, Stalking Bugs and Beaded Buzzers proving best. After a difficult couple of weeks in July there were some problems with an algae bloom in lakes two and three. We would like to apologise if, at times, this has interfered slightly with the fishing. We are glad to say that the lakes are now looking splendid once again. Sport has been typical for this time of year, making anglers work a little harder for their catches. Daddies, Buzzers, Bloodworms, CdCs and Diawl Bachs have been very productive. 'Last of the Summer Wine' member Dougie McMurdo from Ashington was delighted with an 11lb 2oz rainbow caught from Chatton Lake on an Okey Dokey. Jimmy Forrest from Berwick-upon-Tweed tempted a 4lb 12oz rainbow from Dunnydeer Lake using a Daddy. Edwin Renwick from Wooler caught his first ever fish, a 2lb rainbow from Dunnydeer Lake using a dry fly. Tynemouth Scouts enjoyed their fishing at Chatton on Monday and Tuesday evening. UKCC Level 2 Game Angling Coaches Ali Anderson and Dawn Dixon gave tuition on the evenings, and a special thank you to Jan Robinson for all her help. Reminder of our Junior Taster Sessions, please visit our website for further information (www.chattontroutfishery.com) and also GAIA Open Day on Saturday August 13. The fishery will be open to all anglers as normal on this day. Some fantastic hard-fighting fish have been reported, including some lovely brown trout. Two brownies tipped the scales at 4lb 4oz, taken by Nick Evans and Mr Cooper. A cracking 5lb rainbow was taken by Andrew Cox. Andrew Wiles took one of the best bags of the summer, catching 24 fish. Some anglers produced fantastic bags and others caught and released up to 27 fish in a single session. 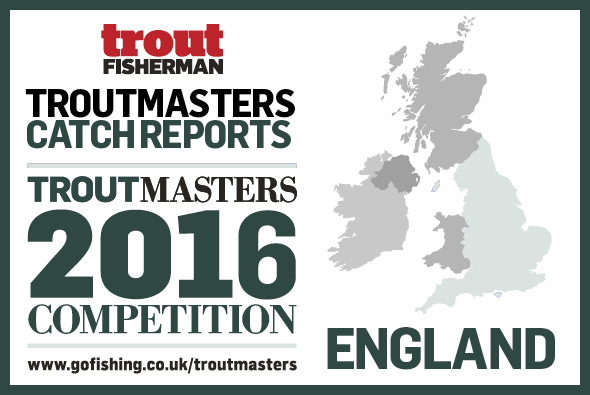 The fantastic catch results are predominantly coming to boat anglers, although the bank fishing is starting to pick up in certain areas. This week’s rod average is 4.49 and is likely to pick up with the forecast for more cloudy conditions. Popular boat areas have been Sludge Point, Gaynes Cove, the dam, Willows, the middle (drifting), the Seat, west bank within the weedbeds and the Boils. Methods fishing well include tubes on intermediate lines, Di-7 and Di-8 lines with Buzzers, Diawl Bachs and lures; and floating lines (washing-line style) with Buzzers or Diawl Bachs (fishing long leaders). The dry fly is making a comeback this week so make sure you have some in the fly box, particularly over weedy areas. The dam is by far the most popular bank spot and certainly a good area to fish a Hare’s Ear for shrimp-feeding fish. The wind tends to blow into the dam making it an ideal place to cast a line out and let it drift around in an arc towards the bank. The takes seem to be very close in, only 1-15 feet, with the south side being the better spot at the moment. Other areas that may be worth a try include wading from the Seat and Plummers car park. Lots of perch to the 4lb mark have been reported, although generally the predator fishing has been tough. Breakfasts now available in the Harbour View (above the fishing lodge) in the Mander car park. The AWAI Midland Final on July 25 was won by Flash Attack Reservoir Dogs, 52 fish for 112lb 3oz; 2nd Pitsford Pirates, 40 fish for 89lb 2oz; 3rd Greenwell Persuaders, 35 fish for 78lb 11oz; 4th Iain Barr Fly Fishing Team Costa, 32 fish for 72lb 15oz; 5th The Renegades, 28 fish for 64lb 8oz; 6th Elinor, 25 fish for 60lb 12oz; 7th Rio Masters, 24 fish for 55lb 3oz; 8th Mid Northants Saints, 22 fish for 54lb 1oz; 9th Soldier Palmers, 23 fish for 53lb 9oz. The top three teams go through to the International Final at Rutland Water and 4th and 5th placed teams have qualified for the Grafham Water Championship. The best fish weighed 4lb 1oz and was taken by Phil Shaw-Browne. Charlie Abrahams took the best bag at 27lb 15oz. Grafham Water Fly Fishers (GWFFA) is hosting a free skills refresher afternoon on Saturday August 27 at the Grafham Water Fishing Lodge from 1pm. In addition there may be an opportunity to go out with an experienced GWFFA member for an afternoon’s boat fishing skills coaching. This will be on a limited basis and dependant upon demand. There will be a small charge of £5 towards the cost. Please book your place by emailing chairman@gwffa-grafham.co.uk with you name, contact details and if possible give an idea of the skills coaching you would like. Confirmation of your reserved place will be emailed to you. Although challenging at times, dry fly has proved very effective in overcast conditions. Long drifts right across the reservoir have yielded the best results with the best patterns being Crippled Midge, Shipman’s Buzzer, Bob’s Bits, Hoppers and CdC Buzzer. Favourite colours are claret, brown and orange. Harvey Smith and his boat partner brought 18 fish to the boat on small dries on Tuesday. The Duffy duo had the best sport, fishing Claret Hoppers in the wind lanes on Wednesday. On Friday Steve and Pat from Blithfield took 36 fish on claret dries. Another method working at present is the washing-line with a small Booby on the point and Crunchers or Diawl Bachs on the droppers. The bank fishing continues to present a challenge, although Bob Draper and John Smith are still managing to winkle out a few fish. Best boat areas are the main basin, middle of reservoir, boils. Best bank areas are the dam, and platforms 4 and 5. Dan Pitcher of Langham netted the best fish of the week, a superb 5lb 14oz rainbow which fell to a Minkie fished on a floating line off the peninsula shoreline last Sunday. The best brown of the week at 5lb 2oz was recorded by Jim Watts of Ryhall. It fell to a Diawl Bach fished on a midge-tip off Lax Hill. Jim shared a boat with Robbie Winram and the pair netted seven fish in a half-day session. Ketton’s Paul Wild had a good day boat fishing up the South Arm on Sunday, taking seven rainbows weighing 2lb 8oz to 3lb, all on CdCs. Will Earland, making the most of his school holidays, had a nice brace of rainbows at 3lb 9oz and 3lb 2oz on dry fly while fishing with Rob Waddington. It has been a testing week with cooler temperatures encouraging more bank and boat anglers. However, while the water temperature remains high the clearest water for boat anglers is up both of the arms. Patience and skill have rewarded some anglers with quality rainbows and browns; with dries followed by nymphs working best. Fishing around the aerators in the warmer temperatures has been common practice and moving from one to another has brought the best results as the number of fish around each aerator has varied. A few anglers have been on the bank and some of the weed-free spots have produced fish. Food items have included corixa, shrimp, snails (some very big), fry and an increasing number of sticklebacks. Week 11 of the Tuesday Night Boat League was won by Empingham’s Gary Cooper with five fish for 11lb 1oz, beating his son Richard into second place with four fish for 9lb 7oz. Hilary Tomlinson took third place with three fish for 5lb 10oz. Chris Evans won the prize for best fish on the night with a 3lb 2oz rainbow. The Anglian Water Over 50’s Match on July 30 saw 16 anglers take some good fish around the 3lb mark caught up the arms, despite it being hard going at times. Alan Stern and Nigel Angus won with six fish for 14lb 7oz from the Normanton Church area, including a quality brownie of 4lb 1oz (caught near the end of the day). Second were Dave Porter and Mick Connor, three fish for 9lb 1oz, third Tug Lawson and Steve Cranson, three fish for 6lb 1oz. Lake one has been restocked this week from the cage. Fish are falling to a variety of patterns including Blue-flash Damsel, Cat’s Whisker, Blob, Montanna and Sedge. Brown trout end of the same lake saw Daddies on top doing well in the evenings, otherwise fish are on Buzzers. On lake two great sport to dries including CdCs, emergers, Klinkhamers and Shipman’s. But if it’s stormy weather try a bit deeper on Buzzers and Blobs under a bung. Best evening fly is still a Sedge. Luke Weaver landed 12 fish in a morning session on dries but rod average here for most is three fish per rod. It’s been reasonably quiet of late, what with the school holidays and all. Even so, 48 anglers fished the lakes and returned a respectable rod average of just under three. The 15 fish bag limit remained elusive this week and the only angler to reach double-figures was J. Thompson with a catch of 10 fish. F. Ward, J. McLeod and S. Thompson all caught eight fish each, while P. Wilks had a bag of seven fish. The best fish of the week was an impressive 6lb 8oz rainbow caught by F. Ward. The best flies have been CdCs, Shipman’s and Buzzers, although Hare’s Ears did come on strong towards the latter part of the week. The weather forecast is for more of the same with warm temperatures and good cloud cover which should keep the hatches going and give some good top of the water action.